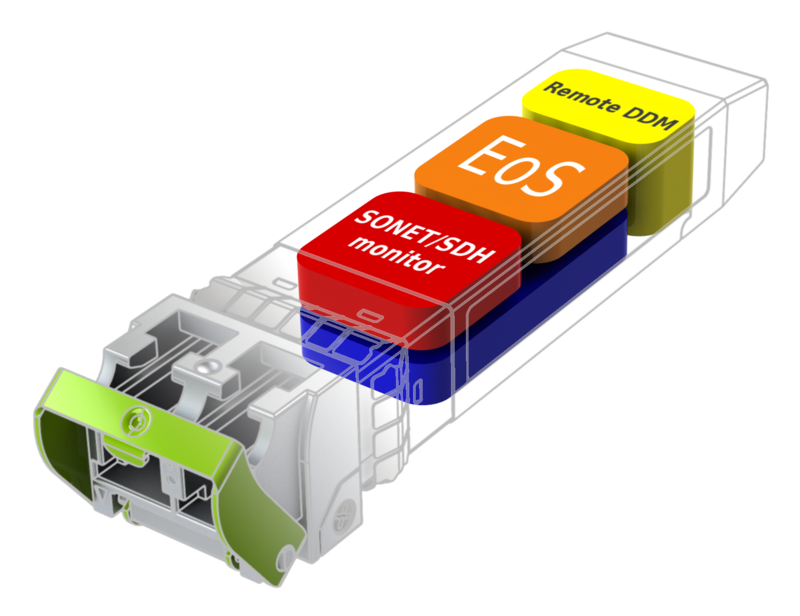 EoS (Ethernet over SONET/SDH) Smart SFP+supports transport of Ethernet packets over OC-48/STM-16. Designed in conformance with the Small Form Factor Pluggable 20-pin Multi-Source Agreement (MSA), EoS Smart SFP+ can replace an existing SFP+ in a router or a switch and transport Ethernet packets across a SONET or SDH network. By inserting the Plug-and-Play Smart SFP in a free 10GbE port, any router or packet switch can be upgraded to support 2.5 Gbps Packet over SONET/SDH, saving power, space and cost. Additionally, it provides extra flexibility, as any number of SFP+ ports can be upgraded to provide a SONET/SDH network interface. The integration of the EoS function into an SFP+ greatly reduces system and network complexity, offers lower carbon footprint, and brings CAPEX and OPEX savings.